Love this faucet !! Can't say enough about. Everyone thought I was crazy because it looked too commercial til we installed it and they said I did well. Lots of compliments. The pull-down, dual action spray head on the VIGO Edison Pull-Down Spray Kitchen Faucet allows for your choice of aerated flow or powerful spray for all your modern kitchen needs. 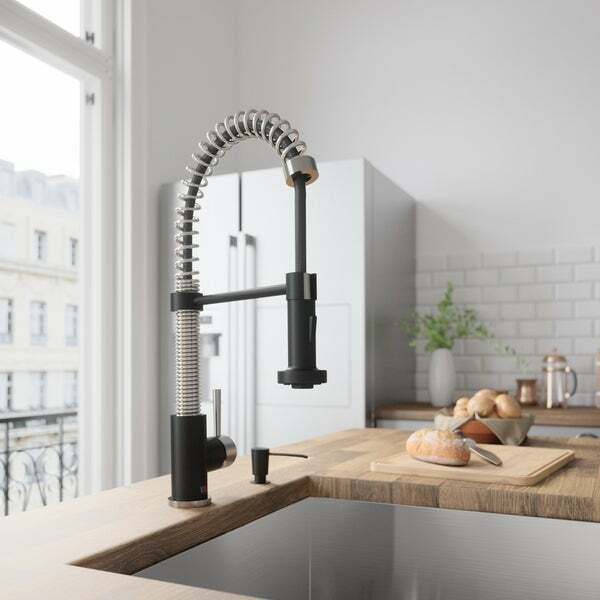 The 360 degrees swivel spout extends up to 30 inches, and its spiral details and solid brass construction make it a highly functional and beautiful statement piece. Features a matte black soap dispenser to bring added functionality to your kitchen remodel. This faucet replaced a similar style we installed 4 years ago, but kept breaking. The vigo is quality, solid brass parts, not painted plastic like many of its pricey competitors. I love the 2 tone...it makes it look modern and yet still somehow classic. This faucet was easy to install worked well in our modern kitchen. Quality was superb and we get tons of compliments. The cord works well and slides back in when done using it. This faucet looks exactly like what is shown in the pictures. It's very sturdy and we'll made. You can definitely tell the manufacturer cares about the product based on every little detail, down to the shipping box. I felt like I was opening an expensive electronic! I'm far from a plumber and was able to install it within a little over an hour. The faucet is very sturdy. Looks great. Style, color and manufacturers reputation.